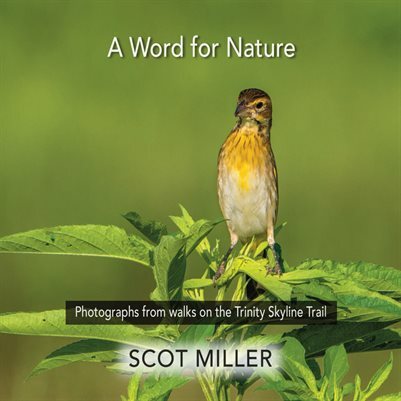 “A Word for Nature” is based on photographs taken by Scot Miller on sixty-five walks on the Trinity Skyline Trail in Dallas, Texas from April to August, 2017. At least one photograph from each walk is included in the book. There are a total of 129 photographs highlighting the natural beauty of this special area. In a brief introduction, Miller lays out a case for embracing and creating a long-term plan for caring for nature in Dallas’s Trinity River greenbelt and Great Trinity Forest, advocating for a new structure for managing the natural resources of the river and forest. There is also a short statement at the end of the book. Other than that, the photographs do the talking. They are presented in calendar order with no accompanying text. Individually, the photographs are engaging but collectively they make a powerful statement.